West Des Moines Association of Professional Fire Fighters participated in the annual West Des Moines Human Services Preschool Holiday Party. This event provides gifts to over 100 children from West Des Moines who are less fortunate then most in our community. All city departments donate money to the event to purchase gifts for these children. 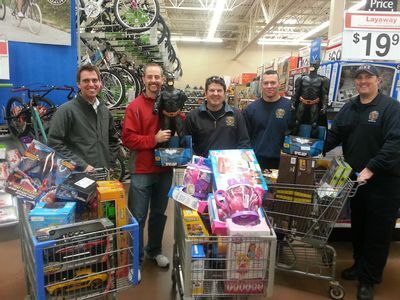 Volunteers; including 6 of our members (Jake Shapansky, Bob Monson, Eric Kozak, Vince DeBoer, Paul O'Connell, and Eric Brenneman) spent the morning of November 30th shopping for gifts. This was considered a great success thanks to the two foot tall Batman that was found. The Holiday Party was then hosted at Fire Station 17 where Santa gave these gifts to the children! Seeing the kids' faces light up is a true joy. Thank you to those who donated time and money to this great event.